So it’s been several months since we’ve had a blog post here and it’s not because we’ve been being lazy – quite the opposite in fact! The last post mentioned marriage and a certain wedding in September, which was a great occasion with hearty food and drink, featuring especially good burgers and great local beer. It was therefore an honour when we were asked to design and implement a website for Robin and Sean who provided said tasty refreshment and are going into business together providing artisan event catering. So for the last 3 months Kiri has been busy with the design side of things and I (Steve…Kiri’s husband…I probably should have introduced myself earlier) have been doing the more geeky technical implementation. 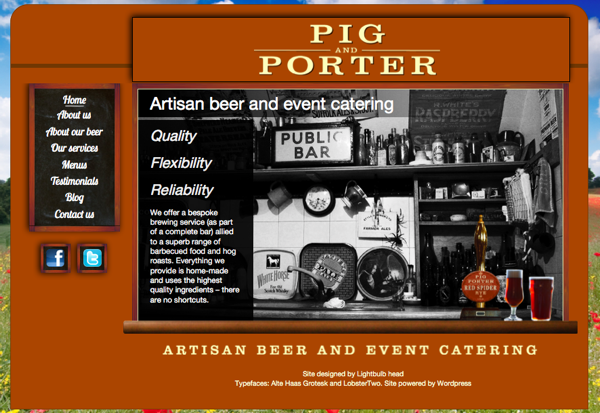 We are therefore proud to present the website of Pig and Porter – www.pigandporter.co.uk. It’s been a great learning experience for both of us working with Robin and Sean as they had clear ideas about how they wanted to create their brand, but they were also open to our (read “Kiri’s”!) creative suggestions. This is officially our first website project working together as designer and geek, although our church website (www.stmarkskennington.org) is high up the list to have the ‘Kiri’ treatment having only been created by Steve to date. Firstly, however, we’ll focus on designing this site. The plan is that in the new year, I (Steve) will merge my photography business, currently trading as srphotos.co.uk, with Lightbulb Head and Kiri and I will be able to bring complimentary skills to the business. That’s all for 2013 though! For now, it’s Christmas and we will focus on the light.